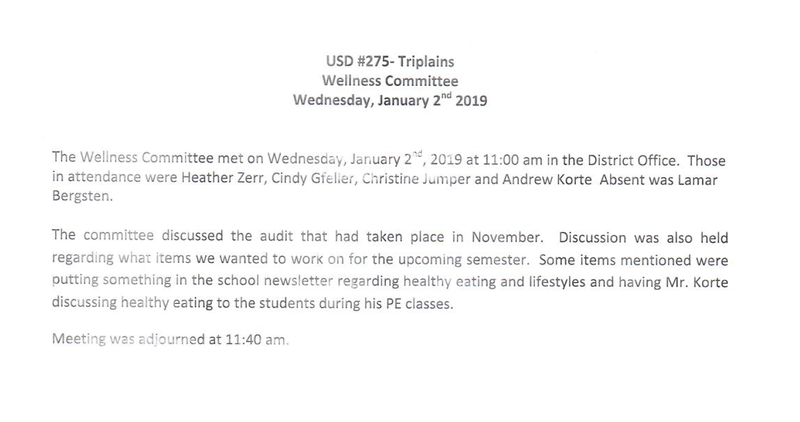 If you would like to serve on the Triplains wellness committee, please contact Lamar Bergsten. The Wellness Committee met on Monday October 22nd, 2018 at 2:00 pm in the District Office. Those in attendance were Lamar Bergsten, Heather Zerr, Cindy Gfeller, Christine Jumper and Wellness Coach, Bev Stafford. Absent was Andrew Korte. Mrs. Stafford met with the committee and went over policy implementations, smart snacks, and fundraisers.